Collecting And KNOWING Roger Maris! 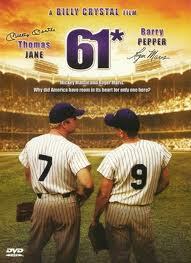 That’s the amazing tale of Andy Strasberg and Roger Maris. Yes, this is evidence of what a sincere fan letter can accomplish. We never discussed his fan mail or his philosophy regarding autograph requests. In the early 1980s, while I was working for the Padres my boss, Elten Schiller asked me if I could get Roger to autograph a few first day covers for his collection. I asked Rog and he said absolutely which made me look like a hero to Elten. Soon after Roger passed away, I received in the mail a baseball that an artist had painted Roger’s image on and it had Roger’s autograph. The ball was sent as a friendly gesture from long time collector Barry Halper who knew of my admiration for Maris. And a couple of years after Roger passed away, I received a surprise package from Roger’s wife, Pat who had enclosed a few autographed items for my collection and thought that I would enjoy them. And finally, while I was working as a consultant on the HBO movie 61*, Barry Pepper, who played Maris in the movie, remarked that he was trying to get an autograph photo of Roger and one day while we were taking a break in between shots on the set of the Yankee Clubhouse I surprised him and gave him an autograph photo of Maris hitting #61. Barry was speechless and tears welled up in his eyes as he thanked and hugged me. I can’t say enough about Andy’s new book Baseball Fantography. Get two: one to savor, and one to share. It’s a perfect present for a fellow fan. Coming Wednesday: Kiss blank index cards goodbye! What’s RIGHT With the Autograph Hobby? The Autograph Card In Action!